Annie was born in London to Gaythorne and Mildred Savill. She spent some of her childhood, with her brother Billy, in Woodmancote, Gloucestershire where her father farmed Jersey cows and shire horses. The whole family hunted with the Cotswold Hunt. Educated at Westonbirt School, Annie joined the WRENS in 1942, serving in Suez, Alexandria and Cairo in code-breaking and cipher work. After demobilisation at the end of the war, Annie worked as a secretary at the US Embassy. Then followed a cordon bleu cookery course which led to her running the underground dining room for MPs next to Churchill’s HQ. In 1951 she married Edward Bogusz; together they farmed at Galleypot Farm, near Chadlington. The marriage did not last long and Annie returned to work as sous chef at the Royal Oak in Yattenden. In the late 60s she bought a shop in Burford which she turned into a cafe called the Green Door. She soon became bored with the tourists and serving chips with everything! After moving to Meadow House in Milton she worked as a chef at the Lamb in Shipton. She retained her love of horses and hunted regularly with the Heythrop Hunt. In 1979, Annie bought Shipton Lodge Cottages where she was able to keep horses and only stopped riding in the early 90s when she broke her hip. She rented out her stables, keeping a close eye on her tenants to ensure that their horses were well cared for. She became an active, enthusiastic, hard-working member of the village, sitting on the fund-raising committee for the Macintyre Trust which ran Tall Trees, on the steering group developing the New Beaconsfield Hall, raising funds for the purchase of the Wild Garden and as chairman of the local Conservative Branch. She was a member of MUWAGA for many years. Cooking was one of her many joys and she organised meals for Gardeners’ Question Time evenings, and cooked marvellous meals in clients’ homes as well as for the Day Centre until well into her 80s. When that became a bit much she joined the rota for the Monday Coffee Mornings. 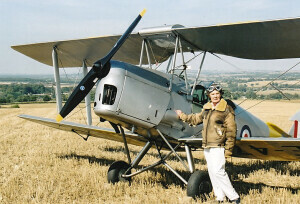 Annie was renowned for her zest for life, flying a Gypsy Moth plane for her 80th birthday, carriage riding in Wales for her 85th and dining at the Manoir aux Quat’Saisons when she reached 90. After being burgled in 2015, Annie found living alone increasingly difficult and, when she began showing signs of developing dementia, moved to a nursing home in Stow on the Wold and finally to The Homestead in Carterton, where she died peacefully on 12 September. Annie’s sense of humour and zest for life will be remembered by all who knew her.